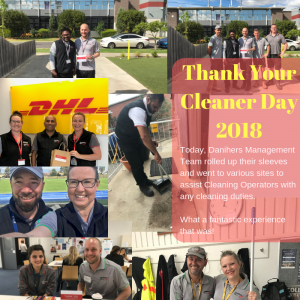 Danihers celebrated Thank Your Cleaner Day on Wednesday 17th October. Our management team rolled up their sleeves and went to various sites to assist cleaning operators with any cleaning duties. What a fantastic experience that was! Thank Your Cleaner Day is an International Day dedicated to all cleaners in thanking them for keeping their workplaces clean, safe and hygienic. Danihers team dedicated their time and effort in assisting our cleaner operators with their day duties on Wednesday 17th October. Danihers management team has thoroughly enjoyed this journey. We have taken some amazing photos of the day as well as some great stories which we wanted to share. Ravindra Jayathungage, our Business Unit has mentioned that it was great to spend their Wednesday morning with Andrew (Danihers) and Tush (cleaner operator) at RIO Tinto. Tush was overwhelmed by Andrew’s visit and helping him out with his work. At Notre Dame College in Shepparton, Principal – John Cortese got involved with the day and sent out a beautiful Thank You email to all Danihers cleaner operators on the site. It was great to see that our clients got involved with the day. 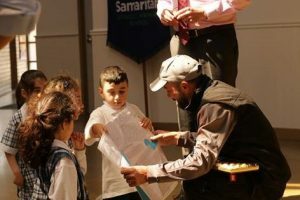 At Good Samaritan Primary School Principal – Paul Sedunary invited Ajan, Danihers cleaning operator, to celebrate Thank Your Cleaner Day with the year one students. They made a poster for him to say thank you and it was presented to him in front of the staff and the students. 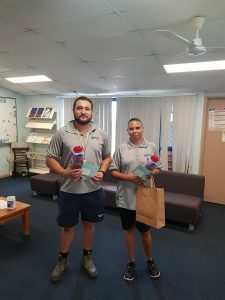 Gez Mulvahil, Principal at Sacred Heart Primary School in Palmerston, Darwin got involved with the Thank Your Cleaner Day and has given gifts to Katrina White, Danihers cleaning operator and maintenance operator, Brenton Motlop. Both, Katrina and Brenton are doing excellent work at this school and are working well together.